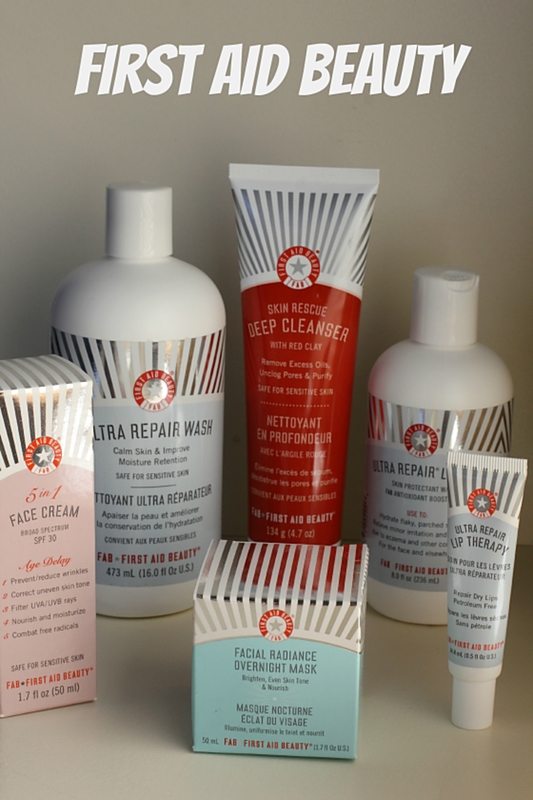 Review of First Aid Beauty skincare line. First Aid Beauty (also known as FAB), is a skincare line free of harsh chemicals and known allergens, alcohol, fragrances, and artificial dyes. Select products also boast FDA-approved over-the-counter formulations that target specific skin issues such as eczema and acne. The brand has around since 2009, founded by industry vet Lilli Gordon when to fill the void in the prestige skincare market for super sensitive skin. "1tiiBGo" target="_blank" rel="nofollow">Ultra Repair Lotion: The brand&apos;s hero product is the "1kVNnUh" target="_blank" rel="nofollow">Ultra Repair Cream and this is the lightweight, fast-absorbing take on it for face and body. It&apos;s a fragrance free moisturizing lotion that also relieves minor skin irritations and itching due to eczema. It is very lightweight and I like how it absorbs given how hydrating it is. It&apos;s $28 for 8 oz and it goes fast. "VG8duW" target="_blank" rel="nofollow">Ultra Repair Wash: Lathers up into a creamy wash. No fragrance or irritating ingredients. I could take it or leave. At $25, I&apos;m inclined to leave it. 5 in 1 Face Cream: A multi-tasker after my own heart. Contains almost 5% Zinc Oxide for broad spectrum SPF 30 coverage, Bisabolol for soothing, Alpha Arbutin to even skin tone, an antioxidant booster comprised of Licorice Root, Feverfew, and White Tea to combat free radical damage, and Homeostatine, a complex of natural botanicals to prevent and reduce wrinkles. It&apos;s not as lightweight as I would like, probably because of the zinc oxide but I obviously like that it&apos;s one product for 5 important steps in a good skincare regimen. It&apos;s fragrance free but I get a sunscreen-like smell from it. "YAF2vh" target="_blank" rel="nofollow">Skin Rescue Deep Cleanser with Red Clay: One of my favorites of the group is this gel cleanser. It works great for both combination and oily skin (which is totally me) and it has Red Clay to draw out skin toxins, Rosemary Leaf Oil (an astringent) and botanical antioxidants. It lathers up into a light foam and deep cleans. You can definitely smell the Rosemary Leaf Oil. "1tii3jV" target="_blank" rel="nofollow">Facial Radiance Overnight Mask: Very lightweight and cooling. I can&apos;t do heavy night creams so I like this formula. It absorbs quickly and has a blend of Omega-rich fatty acids and brightening agents to nourish and reduce discoloration. I woke up a little shiny but in a good way! This formula is also fragrance free. Reminds me a lot of Simple Vital Vitamin Night Cream. "1kVJChu" target="_blank" rel="nofollow">Ultra Repair Lip Therapy: Goes on very thick and tingles a little. I get a spearmint or minty smell from it, which I don&apos;t mind. Not sure about the $12 price tag though. Final thoughts: If you have super sensitive skin, you may want to try the entire line of First Aid Beauty, otherwise, I only think the Ultra Repair Lotion, 5 in 1 Face Cream, and Facial Radiance Overnight Mask justify their price tags. Have you tried First Aid Beauty?